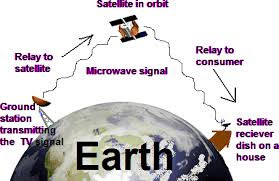 A communications satellite is an artificial satellite that relays and amplifies through the use of a transponder, radio telecommunications signals, between a source and a receiver. Communications satellites are used for television, telephone, radio, internet, and military applications. Satellite communication, in telecommunications, the use of artificial satellites to provide communication links between various points on Earth. Satellite communications play a vital role in the global telecommunications system.